Events in Oltrarno: - - - Art and culture Concerts, live music Theater & shows Let's party! Discover with us one of the most beautiful parts of Florence: the quarters "on the other side" of the Arno, Oltrarno. The wonderful history of Florence lives on in Oltrarno, not only thanks to the so rich historical and artistic heritage, but also in the daily life: in the many restaurants and cafes mantaining the typical athmosphere, in the artisan workshops carrying on a century-old tradition of both spirit and working methods. Firenze-Oltrarno.net includes six sections, with many informations and pictures about the most interesting subjects: choose from the list below and start your tour! The most famous and lesser-known monuments of the historical quarters (Santo Spirito, San Frediano and San Niccolò), lists of all monuments and all museums and a calendar with cultural events. 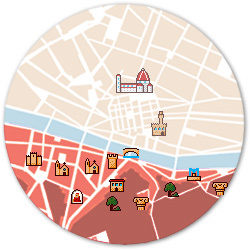 Companies participating to Firenze-Oltrarno.net: artisan workshops, shops, cafes, restaurants, hotels, schools... Browse the Index by categories, the Index by name or search for a company. Oltrarno's craftsmen and shops and their typical Florentine products: informations about traditional craftsmanship and special offers!